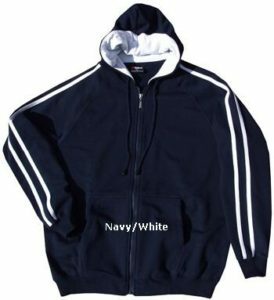 The Club uniform is a white singlet or crop top (for girls) and navy blue shorts or bike pants (for girls). A full range of uniform sizes is available at the Clubhouse at Balmoral Oval on the first three Mondays of the season and from time to time during the season. If you wish to purchase a uniform after our opening night of training please complete the Uniform Order Form and bring with you to a training session. Uniforms are not compulsory unless your child is representing the Club at a Championship or Interclub event outside of the Club’s Balmoral training and competition, however, most children like to wear one. Please attach the Registration Number and Age Patch as displayed in the photo. All borders must be visible. 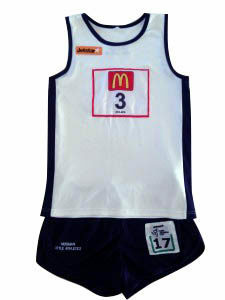 Mosman athletes representing the Club at any championship or interclub event must compete in full Mosman Little Athletics uniform with the following patches (as displayed in the photo above). Any athlete without full uniform and these patches will not be allowed to compete and the team will be disqualified. It is therefore imperative each athlete complies. Patches must not be cut or folded in any way to make smaller. Athletes may wear ‘Skins’ or compression pants underneath their Mosman uniform shorts provided there is no visible logo. Please refer to the attached link as published by the Association. 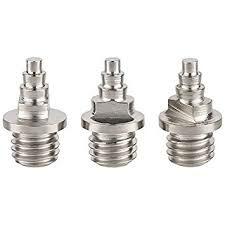 Spikes may be worn for 100m sprints, hurdles, and long jump training only. Trainers/running shoes should be worn at all other times. Spikes may be worn for 100m, 200m, 400m (only when run entirely in lanes), hurdles, long jump and high jump. Athletes must not wear their spikes to every event. Athletes should wear appropriate training footwear (runners) as these will be needed for warm ups, longer running events and throwing events. Spikes must be carried separately (in a spike bag) and only put on when the age manager or coach instructs them to do so just before the event. Competitors in the U11‐U17 age groups may wear spike shoes in events run entirely in lanes, long jump, triple jump, high jump and javelin. Competitors in the U13-U17 age groups may wear spike shoes in all of the events listed above as well as events not run entirely within lanes, except walks. The Narrabeen track has been resurfaced and ONLY “CHRISTMAS TREE’ spikes (also called compression tiered spikes) are allowed to be used in spike shoes on the track. Needle, pyramid or cone spikes are NOT permitted.